You are currently browsing the archives for the Minnesota Vikings category. Chair Anderson added that the proposal caps the stadium reserve account at 127% of the state debt service payments on the stadium to protect taxpayers. “Our bills caps the reserve at a level that already exceeds what is financially responsible in order to protect taxpayers. There is simply no excuse for these funds—much of which are generated by charitable gambling by veterans groups at VFW’s and Legions throughout the state—to sit in a government bank account. People won’t have difficulty understanding that there’s more than enough money in the fund to pay the state’s obligation for the stadium plus a healthy reserve fund plus millions of dollars in excess of the reserve fund. Gov. Dayton hasn’t explained why this money should be used to make the reserve fund for the Vikings Stadium bigger than it needs to be rather than spending this money on 3 veterans homes. I’d love hearing Gov. Dayton and the DFL explain their twisted priorities. Keeping tens of millions of extra dollars in the reserve fund rather than putting it to good use for veterans is twisted and then some. Prior to the Vikings signing Kirk Cousins, I wasn’t totally sold on him. From a skills standpoint, I thought he was better than Teddy Bridgewater and significantly better than Case Keenum. After watching his introductory press conference, though, and watching film of Cousins, I’m totally thrilled he’s the Vikings’ QB for the near future. Something that jumped out for me was that Cousins said he’d met a bunch of Vikings at the Pro Bowl after the 2016 season and that he immediately knew that they were genuinely a tight-nit group. He said all 32 teams talk a good game that way but that the Vikings immediately showed that it wasn’t talk. The impression I got from Thursday’s press conference is that this guy is CEO smooth and he can’t wait to put in the hours to become this team’s leader. As for the people who’ve highlighted Cousins’ record as a starter, that’s the past and it’s irrelevant. This guy is the definition of a leader. Keenum knew how to maximize his performance despite his less-than-impressive arm talent. Cousins’ arm talent is light years better than Keenum’s. Cousins can drive the ball down the field with velocity whereas Case Keenum had to put everything he had into his deep throws. Mentality-wise, Cousins plays with a chip on his shoulder because he’s been underestimated all his life. He was drafted in the 4th round in 2012, the year when Andrew Luck, RG III were the first 2 picks and Russell Wilson was drafted in the third round. In fact, he and RG III were picked by the Redskins. RG III was an instant celebrity whereas Cousins went to work learning the playbook. Now RG III’s career is virtually over and Cousins just signed the richest contract in NFL history. I have no doubt that Mr. Cousins will be the impressive face of the Vikings franchise for years to come. Last year, the Vikings got shredded in the NFC Championship Game by the now-world championship Philadelphia Eagles, finishing the season 13-3 while handily winning the NFC North. On the plus side, they finished far better than the Sporting News predicted. They predicted that Detroit and Green Bay would both finish 11-5, with the Vikings finishing 8-8 and the Bears finishing 3-13. NFL.com predicted that the Lions would win the NFC North. It wasn’t just that they predicted this outcome. Going into the 2018 season, everyone will have their eyes on the Vikings. Kirk Cousins is their starting QB. For the first time in his career, he’ll play behind a rock-solid O-Line. For the first time in his career, he’ll have a plethora of weapons to attack with. Never has he had the opportunity to throw to Stefon Diggs, Adam Thielen, Kyle Rudolph and Dalvin Cook. Never has he had a running game featuring Dalvin Cook. With this collection of weapons, though, comes high expectations. Winning the NFC North is a worthy goal but it isn’t the only expectation. Paying $84,000,000 guaranteed over 3 years gives the Vikings the reasonable expectation of hoisting the Lombardi Trophy at least once in those 3 years. I’m proud to state that I won’t watch tonight’s Super Bowl. I won’t watch because the NFL is attempting to get back in the good graces with the average fan by putting on big displays featuring the military. Apparently, the PR meisters told Commissioner Goodell that the NFL’s ratings drop is tied to the disrespect shown to police officers, the military and the average working joe. At this point, I’ll emphatically state that Commissioner Goodell is the most tone-deaf commissioner of a major sporting league that I’ve ever seen. How could he have gotten the Ray Rice and Charles Johnson rulings that badly wrong? Those are decisions that the average eighth grader would’ve gotten right. Further, what commissioner would’ve gotten things so badly wrong with the kneel-down protests of the National Anthem? The NFL owners can’t be too bright if they agreed to a lucrative contract extension for Commissioner Goodell. What has he done that a dozen other people couldn’t have done better? Wouldn’t Condi Rice make a better NFL Commissioner? I’d predict she’d be light years better than Commissioner Goodell in terms of PR. Part of the reason why I won’t watch tonight’s Super Bowl is because I refuse to watch another Bill Bellicheat-coached team in the Super Bowl. Anyone that thinks that any of New England’s Super Bowl-winning teams is better than the worst of Bill Walsh’s Super Bowl winning teams is delusional. Imagine how many thousands of yards Jerry Rice would’ve accumulated had he played with the defenseless receiver rules they have now. On the flip side of that, imagine the match-up between Gronk and Ronnie Lott or the match-up between Dion Sanders and whoever the Patriots’ top wide receiver was. The great thing about being a Vikings fan is that I don’t have to put up with the stupid things that Marshawn Lynch, Colin Kaepernick or Michael Bennett have done. The Mike Zimmer-Rick Spielman Vikings are old school. They played poorly in the NFC Championship Game but they consistently play the game right. Last year, a script was flipped this season in the NFC North. Going into this season, there’s no reason to think that the Vikings aren’t the pre-season favorite to repeat as NFC North Champions. I’d rather wait until the Vikings are playing the final game of the season. It isn’t a stretch to think that might not be more than a year away. As for Ray Lewis, he was the leader of the Ravens team. It wasn’t that he was the leader of their defense, which he was. It was that he was Baltimore’s leader. When Ray Lewis was playing, every Baltimore player had to play up to Ray Lewis’ expectations. It’s time for the NFL to admit that the Vikings are a legitimate Super Bowl Championship contender. Thanks to their dominant victory over Atlanta (in Atlanta) and Seattle’s victory over Philadelphia, the Vikings are now the top seed in the NFC. Both teams have 10-2 records but the Vikings would get the top seed because they’d win the 4th tie-breaker. Case Keenum turned in another impressive performance completing 25 of 30 passes for 227 yards and 2 TDs without any interceptions. Making that stat-line all the more impressive is the fact that he completed all 13 of his passes in the second half. We saw yet another team significantly alter their offensive strategy, specifically as it relates to the passing game, while going against the Vikings defense. Opposing offenses continue to feature the quick-strike passing game, likely to take away the Vikings pass rush. The good news for opposing offenses is that does reduce the number of sacks the Vikings have; Ryan wasn’t sacked on Sunday. The bad news is it severely limits the ability to register explosive gains. The Falcons came into Sunday’s game averaging 9.3 explosive gains per game, and against the Vikings they had one. This is largely because Atlanta essentially refused to put Ryan on a five-step or seven-step drop to give receivers time to get open downfield. The few times Ryan did try that, he was blasted right as he released the ball and the passes fell incomplete as Ryan tried to pick himself up off the turf. The difference between the Vikings’ defense and the rest of the league’s top defenses is that the Vikings are loaded at all 3 levels, the Vikings are super-physical and the Vikings’ defenders are the best tacklers in the league. The Vikings came into the game with the top third-down defense. Atlanta came into the game with the best third-down offense. When the statistics were compiled, the Vikings’ defense stopped Atlanta’s offense 9 times in 10 third-down opportunities. As good as they’ve been, there’s no letting up for the Vikings. Next week, they take on the Carolina Panthers in Carolina. Considering the fact that the Panthers got whipped by the Saints yesterday, the Panthers will likely be ready to play the game of their lives. The good news for the Vikings is that they’ve met each of their challenges this season. After NFL Commissioner Roger Goodell and DeMaurice Smith, the executive director of the NFLPA, criticized, NFL owners tried limiting the PR hit the NFL will take for taking a knee rather than standing at attention for the National Anthem by releasing statements. Zygi and Mark Wilf issued this statement. With all due respect to the Vikings, that statement is spin. For instance, saying that “we believe in promoting thoughtful, inspiring conversation that unifies our communities” is BS. When the St. Louis Rams’ wide receivers came out of the tunnel and did the ‘hands up, don’t shoot’ gesture, was that the Wilfs’ idea of promoting thoughtful, inspiring conversation that unifies our communities”? 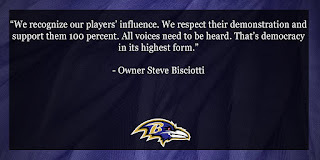 I wonder if Mr. Bisciotti would feel the same way if one of his employees spoke out of turn for one of his other companies, especially if that employee’s statement hurt Mr. Bisciotti’s business. 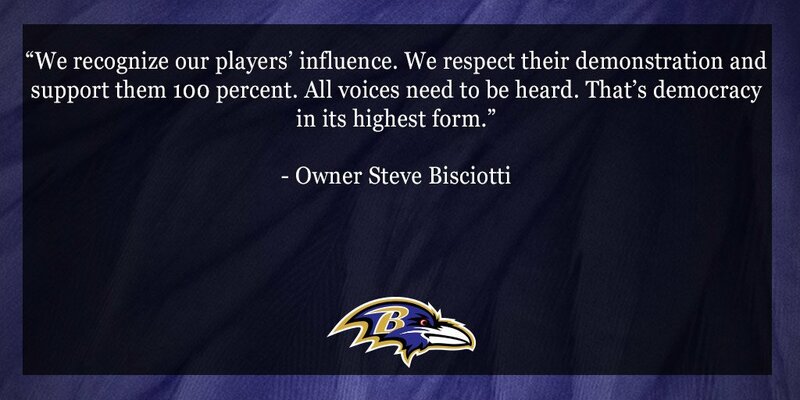 I’m betting that Mr. Bisciotti wouldn’t have the same attitude with his less famous employees who hurt his business. And make no mistake about this. Mr. Bisciotti’s NFL ’employees’ are hurting his business. Like Zygi Wilf, Commissioner Goodell is an East Coast progressive. They live inside the East Coast progressive echochamber. Witness the surprise that Commissioner Goodell had when the public criticized him for his Ray Rice suspension. He didn’t have a clue that the penalty was inadequate. It wasn’t until he realized that the NFL was experiencing a PR nightmare that he revised the penalties. The NFL ratings will continue to take a hit. There might be some fluctuations but the trend will be unmistakable. Until the NFL and the Vikings start understanding what people expect, their PR problems and their product will suffer. The only thing you can say about the Vikings’ season opener is that they dominated the New Orleans Saints in every facet of the game. Sam Bradford completed 27 of 32 passes for 346 yards. (That’s an 84.4% completion percentage and a QB rating of 143.) Stefon Diggs caught 7 passes, including 2 for touchdowns, worth 93 yards. What’s frightening is that he wasn’t the best wideout on the field for the Vikings. That was Adam Thielen. Thielen walked on at D-3 Minnesota State, Mankato. Then he wasn’t drafted so he tried out for the Vikings. He spent his rookie season on the practice squad. Tonight, Thielen caught 9 passes worth 157 yards. Rumor has it that former Vikings running back Adrian Peterson was in the house tonight. Rumor also has it that future Hall of Fame QB Drew Brees was in the house tonight, too. Adrian’s first run was his longest of the night. It was for 9 yards. Brees played valiantly but it wasn’t nearly enough. He didn’t throw for a touchdown until New Orleans had all but officially lost. The other major story from tonight’s season opener was the Vikings’ offensive line play. They protected Sam Bradford. They opened holes for Dalvin Cook. You know the line is playing well when the QB completes 85% of his passes and 8 of those completions were for more than 20 yards. The Vikings ran the ball 28 times and averaged 4.7 yards-per-carry. There were lots of Vikings fans that worried how they’d play. I’m one of them. The offensive line had 5 new starters. Berger moved from center to right guard to make room for Ohio State rookie Pat Elflein. It’s easy to see why the Vikings traded up in this year’s draft to pick him. That kid’s got lots of Pro Bowls in his future. The free agent tackles played well at times, though Remmers still had some unsteady moments. LT Riley Rieff played a strong game. The thing that’s obvious is that this unit is significantly more athletic than any offensive line during the Zimmer era. During the game, they flashed a graphic that said tonight’s opening game was the first time those 5 players played together. It certainly didn’t look that way. Notice what I haven’t mentioned thus far. I haven’t mentioned the Vikings defense. That isn’t because they didn’t play well. There’s no denying that Brees was fairly productive. He threw for 273 yards and a late touchdown. Everson Griffen got the Vikings only sack of the night. That doesn’t come close to telling the story, though. The Vikings’ secondary contested every throw Brees made. The defensive line surrounded Brees much of the night. Brees felt claustrophobic all night, like he was throwing from inside a phone booth. Next up for the Vikings are the Pittsburgh Steelers in Pittsburgh. Let the trash-talking begin.